Fire trucks are meant to scream authority. They have to, they're going to what could be a matter of life and death. What truck do you not want to see show up to save you? In the two weeks I spent in New York, I've seen at least a dozen NYC fire trucks rushing to the scene. Those red beasts scream authority and purpose. They also get jammed in heavy traffic in Manhattan simply due to their size. Well, I guess you need tall ladders for skyscrapers. 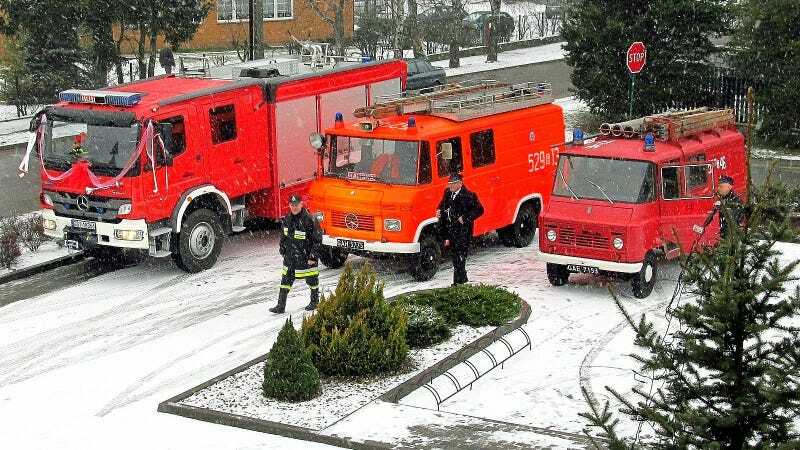 If you look at the top image, you see two Mercedes-Benz fire engines, and something that isn't a Mercedes-Benz. It's a Żuk from Poland, based on an old Warsava, which was a copy of the Russian GAZ-M22 "Pobeda". And since the standard Żuk was rubbish, it's a fair guess that the fire engine version sucked even harder. Polish firemen, have your say! In Soviet Russia, Volga Station Wagon Hauls Family Cadre and YOU! Is there a worse fire engine that you can think of?